View all full descriptions on the Services Page. Additional travel fee for other areas, select your location below. Do you have a Hawaii ID? You may change your selection any time to see updated savings! NOTE: Everyone receiving discounts for residents must present Hawaii ID. Discount for Current Email Subscribers Only. Save $20 off 1 Massage! Save $30 off Two for a Couple! NOTE: only one therapist, sessions back-to-back. Save 20% off a Package of 3 or more! NOTE: Cart will only reflect currently selected services. Do not "Check Availability" for more than one service unless you plan to book them all back-to-back on the same day! This system cannot do multi-day bookings, only one day at a time! For a total package price quote, you can select 3 or more services below. However, do not "Check Availability" for more than one service unless you plan to book them all back-to-back on the same day, with only 10‑15 mins between sessions. Example: If you "Check Availability" with three 2‑hour sessions selected, the system will only look for one large 6‑hour block of empty space where all three will fit at once. If you want to book only one session of the package now, select only one service below (or two for a couple) to check availability and make your reservation, then pay for the full package at the time of service. Don't see a special you saw in a magazine, newsletter or on a flyer? Mention it with some details in the "Notes" section on the checkout page! Therapeutic Blend is fully customized to your needs! It may include any of the styles listed below, as well as myofascial release, neuromuscular, abdominal and structural integration techniques. This massage is performed draped, on a traditional Thai mat. Customize a Deep Tissue Massage if you prefer this on a table. Thai 'Yoga' Massage blends massage, acupressure, meridian therapy and assisted yoga stretching. Thai has been described as a "dance" of massage, as the therapist moves, stretches and supports your body through an assisted yoga routine, for which it's also fondly called "Lazy Man's Yoga!" Meditative bodywork with slow, relaxed stretching leaves little untouched, with extra attention to all areas in need. A thorough massage from head to toe that can deeply restore and revitalize! This massage is performed clothed, on a floor mat. While a regular Thai Massage keeps a balance between massage and stretching, Deep Tissue Thai emphasizes the use of energy meridians and acupressure points using steady, sustained pressure, followed by a shorter stretching routine that's targeted to problematic areas! Thai Massage is already relatively deep compared to other massage modalities, but for those who like it really concentrated, this one may be for you! A luxurious blend of East and West, fluid and flowing oils bodywork mingles with therapeutic acupressure, meridian therapy and assisted light stretching to create a soothing, balancing, centering experience of rhythmic massage, movement and meditation. This massage is performed draped, on a Thai floor mat. Customize a Swedish Massage if you prefer this on a table. Therapists use the weight of their bodies, balance and grace to get deeper into the thick, powerful muscles of your legs and hips, providing broad relaxation and release in ways no elbow can. When walking on the back, the gentle, firm alternating pressure on either side of the spine creates a deep pumping, rolling action that can softly realign joints back to their proper place. Finished off with some simple spinal twisting stretches and backbends, being walked on can be wonderful! This massage is received clothed on a floor mat. Reflexology is one of the oldest healing practices to be found documented in ruins of Asia and within Egyptian tombs as early as 2500BC. Practitioners work from the feet and hands up to the elbows and knees, clearing energy blockages and stimulating nerve pathways, in turn stimulating the whole body to heal itself. Finishing with the neck and head, a reflexology treatment may feel almost like a full-body experience! Discounts limited to 10%, unless specific to herbal treatments. Total incorrect with other discounts! Fragrant, delicious herbal blends are wrapped in cloth bundles and steamed hot, allowing their natural oils to be released. 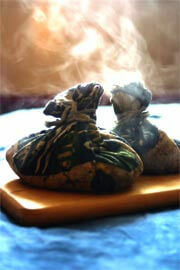 These aromatic hot compresses are applied during the stretches, for deeper opening of the body and its energy. All-around balancing and filled with natural medicinals, heat melts away tension while the essential oils restore the body, lightening and lifting the spirit! Compresses made fresh using lively organic ingredients! This massage is received clothed, on a floor mat. 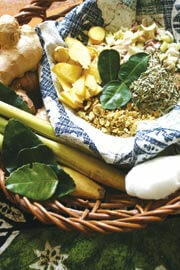 See Herbal Oils Massage for the spa version! Using a silky blend of coconut, almond and jojoba oils, traditional Thai herbal compresses are steamed hot and used during a luxurious full-body massage, like aromatic hot stones that spread and conform to the shape of your body. Moist heat melts away your tension and opens the pores in your skin to absorb the essential oils! This massage is draped, on a floor mat. See Herbal Thai Massage for the traditional version! The long, flowing strokes of Swedish massage provide the perfect escape for one's mind into bliss and contentment. This full-body oils experience uses gliding strokes to flush the body and increase circulation, while rhythmic kneading, tapping and vibration break up blockages, loosen joints, and turns yours into a heavenly body. Most satisfying for the mind and the spirit! This massage is performed draped, on a table. Thai 'Yoga' stretching may be blended into this massage, but the range is limited on a table. Choose a Thai Oils Massage to receive this Thai-style on a floor mat. Deep Tissue Massage uses slower strokes and much firmer pressure to address deeper layers of muscle and fascial connective tissue that lighter styles of massage cannot reach. It may be used simply as a "Deeper Swedish" session for some, while others want substantial time devoted to their neck, back or hips, paying attention to the fine details. This massage may also be customized to include myofascial release, neuromuscular, abdominal, structural integration techniques, Thai acupressure and a range of 'Thai Yoga' stretching. Thai 'Yoga' stretching may be blended into this massage, but the range is limited on a table. Choose a Therapeutic Blend to receive this Thai-style on a floor mat. Discounts limited to 10%, unless specific to extended treatments. Please note: additional travel fees for distance are not discounted. For locations not listed, the fee is $60 per hour (or $1 per minute) of one-way drive time. Adds a minimum fee of $30.00. Realistic estimates for these locations are difficult due to unpredictable traffic, and other elements outside of the therapist's control. Final total will be known when the therapist arrives. Service to locations requiring valet service and/or long distance trekking may incur additional charges. Please note that all travel fees above are general quotes, based on the minimum number of miles and/or minutes it usually takes to get to an area safely with normal traffic patterns. If you'd like a more specific quote, please get in touch! PLEASE NOTE: There is only one therapist! Multiple services will be provided back‑to‑back with a break in between, not at the same time. This system cannot book over multiple days. You may select multiple services for a quote, but "Check Availability" only for services you want to book all at once, in one block of time. Using a VPN? Click Here! Please CALL or EMAIL for orders with more than 6 people! Invalid Input. Please enter a number from 1 to 4, or remove the item. one 90-min or two 60-min sessions. Some VPN servers ("virtual private networks") are blocked by Full Slate's server for scheduling, due to suspicious activity from users with anonymous IP addresses. If clicking "Check Availability" does not display a schedule, you may need to switch to a different server that isn't blocked, or disable the VPN. How would you like to reserve your appointment space? Guaranteed appointment, cancellation policies apply, credit card required (on file), no prepayment necessary. No commitments, but no guarantees. Considered tentative, and still open for secure booking until 2 hours before. With a secured reservation, you are guaranteed the appointment, and it is closed for online booking. Bookings for Today are final. Bookings for Tomorrow may be canceled within 2 hours after booking without a late fee. Bookings 2+ days in advance must be canceled by 9:00 AM the day before your appointment. View the full cancellation policy here.